From college dropout to founder of five startups, David Cancel (@dcancel) is a learning machine. 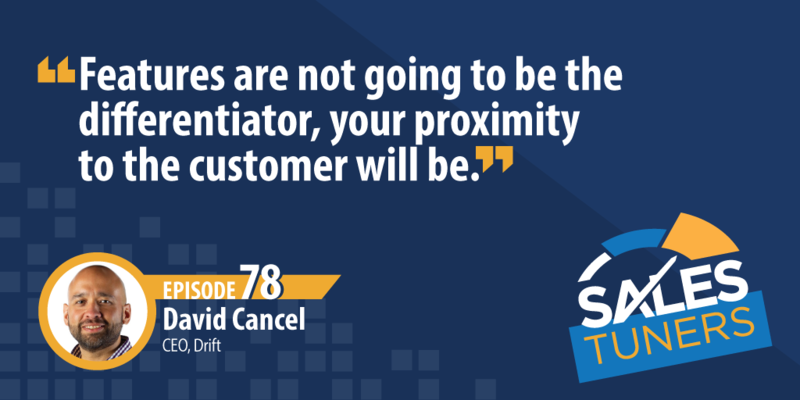 Former Chief Product Officer of Hubspot and current CEO of Drift, David is known for his modern approach to creating technology products and structuring high performance teams. In his book, HyperGrowth, David shares his customer-driven approach to building a business that ultimately sparked his current venture. Growing up David didn’t have the internet. He didn’t have any role models. And honestly, no one around him thought he become much of anything. As a result, he had to figure things out by asking the right questions and putting in the work. A trait he talks about weekly on his podcast Seeking Wisdom, where he describes his journey as stumbling his way to success by learning from the best. In today’s information driven world, David knows anyone can replicate what you’re doing. So the customer and the prospect are the ones in control. As a sales professional, you have to listen to what your prospects are saying to provide the best possible experience in solving their problem. Learn From Others: Everyone learns from failure, but you don’t have to learn from your own failure. Whether it’s your peers, other professionals in your network, books, blogs, or even podcasts like this. You owe it to yourself to seek out knowledge both positive and negative from others. But be careful, you want to learn from the best, not just your buddy or some random stranger. Pride Will Kill You: The stubbornness of pride locks you into your own thoughts. We have a cognitive bias around consistency that once we’ve formulated an idea that we can’t be inconsistent with that or flip flop our position. However, this is ridiculously dumb and short sighted. Be willing to listen to others and study the data that may challenge your worldview. Good Things Come to Those Who Practice: One thing that continues to amaze me is salespeople not practicing their craft. How much time do you prepare for each call? Showing up to work and running sales calls is not practicing. The biggest personal example I have of this is spending 10 hours on a Saturday preparing for a 30 minute call the following Tuesday. Yes, 10 hours for 30 minutes. That’s doing the work.